The rhizomes are a source of food in Native American cultures and it contains vitamins, thiamine, riboflavin, niacin and ascorbic acid. Lotus plant requires space and plenty of sun for it to grow properly. The long stalks extend above the water level and join the leaves at the middle of the blade. The blades float on the surface of the water or above the water. The white/pink Lotus flowers are alone in the nature and open for two days closing overnight. Some of the varieties of Lotus open at dawn and closes again when the sun goes out of sight but other types open in the night and close at dawn. The Lotus fruits are ovoid or 3 dimensional in shape and produce a small nut that inhabit the space inside the flowers. The flowers produce heat while flowering and maintain temperatures of 30-350 while flowering and the flowers are pollinated by beetles. Nelumba nucifera is prominently cultivated in Africa, Australia, China, Greece, Japan and South Korea. The oil is extracted through the solvent extraction process and this may leave some traces which are harmful but the CO2 extracts have a cleaner end product which is true to the oil and is thicker that other extractions. Lotus oil is quite expensive and usually blends with other carrier oils like apricot, jojoba or sweet almond oil and its benefits can be straight away seen on the skin. Nelumbo nucifera contains ß-sitosterol, Glucose, Isorhamnetin 3-O-rutinoside, Linoleic acid, Lotusine, Armepavine, Asparagine, Catechin, Dehydronuciferine, Neferin, Nelumbine, Nelumboside, Nicotinic acid, N –nornuciferine, nuciferine, O–nornuciferine, Palmitic acid, Quercetin and Roemerine. Catechin is found to be an affective component for the treatment of hyperglycemia in cases of non-insulin-dependent diabetes mellitus. ß-sitosterol is a plant sterol which supports the immune system and it is also affective in the treatment of health problems like cardiovascular disease, HIV/AIDS, TB, psoriasis, rheumatoid arthritis, cervical cancer, allergies, systemic lupus, fibromyalgia, asthma, hair loss bronchitis and chronic fatigue syndrome. Traditionally Nelumbine has been used in Chinese medicine to stop bleeding and get rid of idle blood. ß-sitosterol is used for enlarged prostate and women use it for symptoms of menopause and it is also used for the treatment of heart disease and high cholesterol. It is also good for enhancing the immune system and for preventing colon cancer and gallstones, common cold, influenza etc. The odour of Lotus oil is subtle and varies slightly depending on the colour of the oil. The flowers of Lotus are astringent, expectorant, refrigerant, sedative and the seeds are demulcent. The roots are emmenagogue and mucilaginous. The lotus oil is a febrifuge, hypotensive, resolvent, stomachic, styptic, tonic for heart, immune system and nervous system and vasodilator. 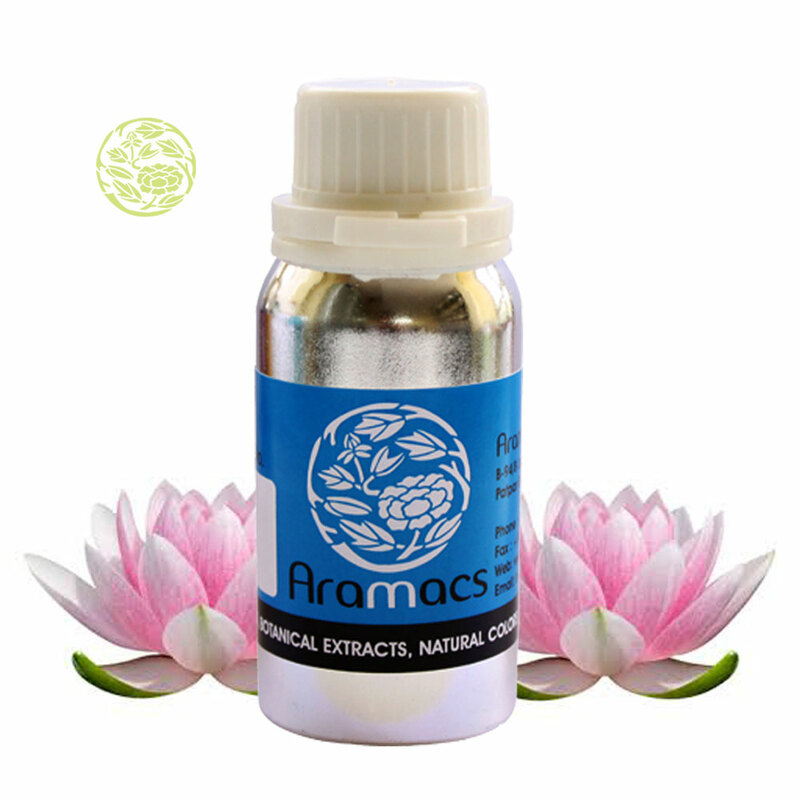 There are three kinds of lotus oil namely blue, pink and white and each with their synergy. Blue Lotus or Nymphaea caerulea is the rarest of the types and is next in terms of energy to Lotus flower essence. 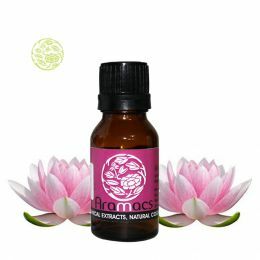 Pink Lotus oil or Nelumbo nucifera works with the 2nd and 3rd chakras and helps to steady one's energies, especially the sexual energies of the 2nd chakra. 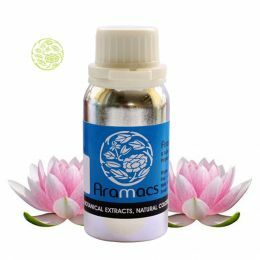 White Lotus oil is more delicate, and takes more time for the benefit to become apparent which is a sense of peace born from clarity. The oil gets one ready for a meditative state, and reinforces one's capacity to connect with one's higher self as a part of one's conscious self development. The lotus seeds have proven to protect the liver from toxicity. The therapeutic value of the Blue Lotus is on a spiritual plane and works positively to the benefit of those who want to work on their physiological energy points which is the chakras. Lotus oil isused to treat fungal infections of the skin and in Asia the seeds and fruit have been used to treat ailments of the gastro-intestinal tract, insomnia, gastro-intestinal tract, cardio-vascular diseases and nervous disorders. The phytochemicals in the Lotus plant interferes with drug therapy in the treatment of diabetes, high cholesterol, psychiatric or cardiac conditions or erective dysfunction based on the constituents of the plants. The Chinese use Lotus to treat everything from diarrhoea to bleeding ulcers and since the plant is a diuretic it can help with your weight loss programme. Lotus plant is in use as a treatment for mushroom poisioning and Nuciferine, an ingredient found in the lotus plant help reduce muscle spasms. The same ingredient may cause hallucinations when mixed with wine. The leaves of Lotus are popular as a treatment for jaundice and the flowers and leaves can be made into tea or garnish for soups. Lotus oil is used as a scent to various personal care products like body lotions, massage oils, bath soaps and also in aromatherapy. 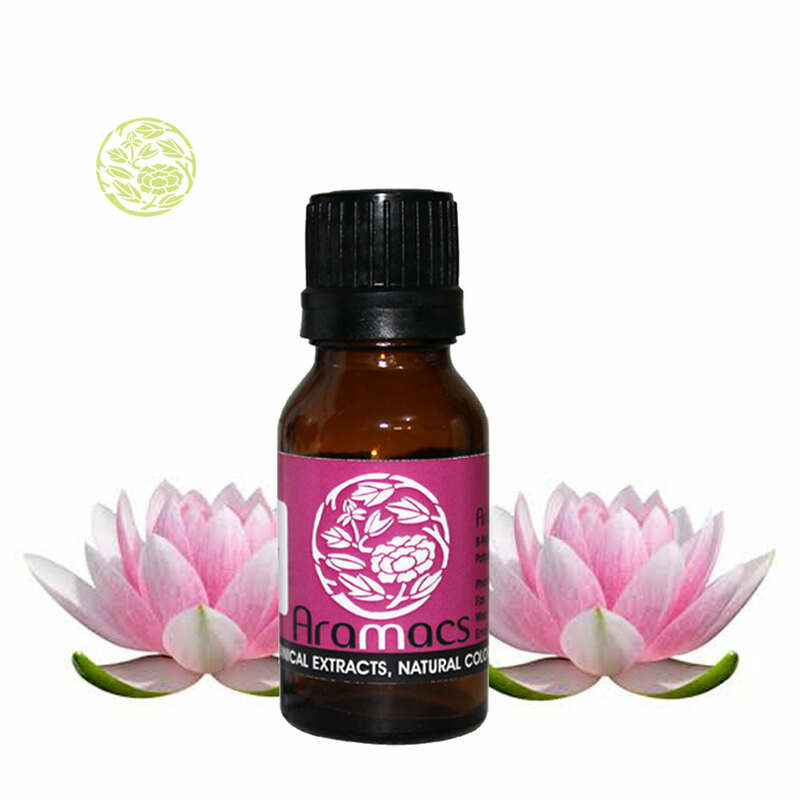 Lotus has excellent healing properties and the oil is one of the most expensive oils. Наше производство - EКO TEC делает проектирование эко – технологий в области агро промышлености, а так же загородного жилья и всего что касается данной области. Наша компания накопила значительны опыт в этой сфере, который используем, в нашей работе. Благодоря этому наша продукция имеет высокое качество здесь http://teplitca.kiev.ua/g4790462-dvuskatnye-teplitsy двухскатные теплицы .